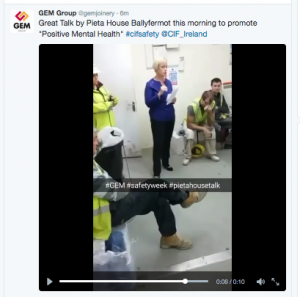 Today in Irish Construction Safety Week 2016 the focus switches to Mental Health. 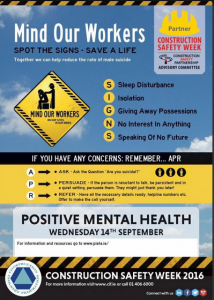 The Construction Industry Federation and Pieta House joint initiative entitled Mind Our Workers is a campaign aimed at raising awareness of suicide and mental health issues throughout the construction sector. Suicide and mental health are two of the most important issues in Ireland. The culture around these subjects has started has changed.in recent years Unfortunately in the past too many people in Ireland sat in deathly silence while brothers, sisters, fathers and mothers were lost - ashamed that suicide had visited their doorsteps. In Ireland, the majority of people who die by suicide are men. If we want to see a reduction in the number of suicides in Ireland then one of the steps that must be taken is to help promote further understanding and awareness of suicide and mental health amongst Irish men. Action is needed to help accomplish this objective. Irish men can be reluctant to discuss their problems and emotions with their colleagues and friends. This is particularly an issue in areas of Irish society which are disproportionately male. In modern Ireland, one of the remaining aspects of society which can still be disproportionately male are certain kinds of workplace. The workplace is a particularly influential environment, given the large amount of time people spend at work and in the company of their work colleagues. Taking all these factors into consideration, and particularly, during Irish Construction Safety Week it would seem that those interested in combating suicide in Ireland need to engage with the construction sector. It is for that reason that this campaign was established – to help mitigate the level of suicide throughout the Irish construction industry. By combining Pieta House’s expertise with the reach and industry insights of the CIF, a greater awareness of suicide and mental health is being fostered throughout the sector. During Irish Construction Safety Week helping to promote a greater level of understanding of these issues will ultimately reduce the number of suicides and most importantly help save lives.